While most soldiers consider family pictures and cigarettes to be some the most valuable things one can have while on tour, Afghan veteran Colin Halloran said he couldn’t live on the battlefield without his collection of books. Halloran, who has published a new book of war poems titled “Shortly Thereafter”, said that’s one of the reasons why he was “not your typical grunt”, a line featured in one of his poems titled “Footlocker”. 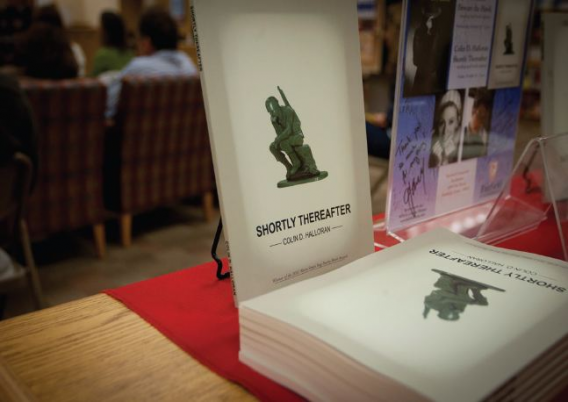 Halloran, who served as a US Army soldier fighting in Afghanistan in 2006, read several poems from his book aloud to an audience gathered at the Fairfield University bookstore last Friday night. He explained that he wrote the collection of poems based upon the experiences and memories he gathered when he was fighting overseas and how they impacted him once he returned home. The various poems in the book deal with several different topics and emotions, ranging anywhere from the sardonically comical account of nicknames people used to call him, to the sad reality of sitting through a boring college class after you’ve returned home and you know there are soldiers still out there fighting. Before Halloran took to the podium to read aloud from his book, Dr. Michael White, Program Director of Fairfield University’s MFA in Creative Writing and personal friend of Halloran, stood before the audience and introduced him. According to White, the men met for the first time about 4 years ago in a small coffee shop in Durham where they talked about poetry, the war in Afghanistan and Halloran’s interest in pursuing a creative writing degree. One year later, Halloran enrolled in the Fairfield University’s Creative Writing program and proceeded to study under White. 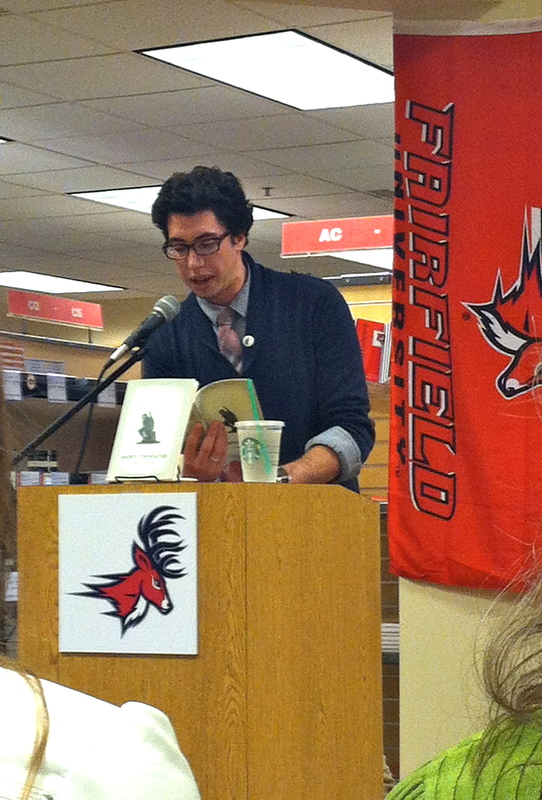 While at Fairfield, Halloran worked on several of the poems featured in “Shortly Thereafter” and used most of them in his thesis. Although the book was only released on October 12th, 2012, it has already garnered some public attention and critical acclaim. So far, the book has been recognized for winning the 2012 Main Street Rag Poetry Book Award. In addition to writing poetry, Halloran also spends time traveling to schools throughout the Northeast where he works with students and teachers to teach them about the benefits of using literature in the history classes as well as how to analyze the ways in which poetry can inform various portrayals of war. During a Q and A session after Halloran was done reading, a member of the audience asked why he chose to write about his thoughts and experiences of war through poetry as opposed to other forms of writing, such as fiction.